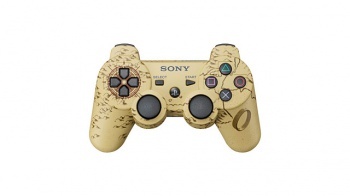 Really big Uncharted 3 fans can now get a controller with a map on it to show their devotion. Sometimes, game-themed controllers look really, really good, but other times they don't look quite so hot. Sadly, this new Uncharted 3-themed DualShock 3 controller - with its tan and brown color scheme - falls into the latter camp. The front of the pad features a map design, with the compass rose surrounding the d-pad, a smattering of mountains and coastlines across the pad's face, and Nathan Drake's ring on the right handle. The design makes sense considering the game is all about exploration and discovering lost cities in the desert, but it really isn't pretty to look at. You'd have to really like Uncharted 3 to want to pick up that pad, especially because it's literally just a regular DualShock 3 with a new color scheme without any other features. At the moment, the controller has only been announced for Japan, but it's hard to imagine that it will stay that way. Uncharted 3 comes out for PS3 on November 1st. The pad comes out in Japan on November 2nd.